The Staff Health team at Cumberland step out for Steptember. In just one week, WSLHD Steptember teams have raised an amazing $22,212, earning us second place on the NSW Health leaderboard. We’re not doing too badly on the exercise front either, with 152 teams taking a total of 33,628,260 steps over the past week. 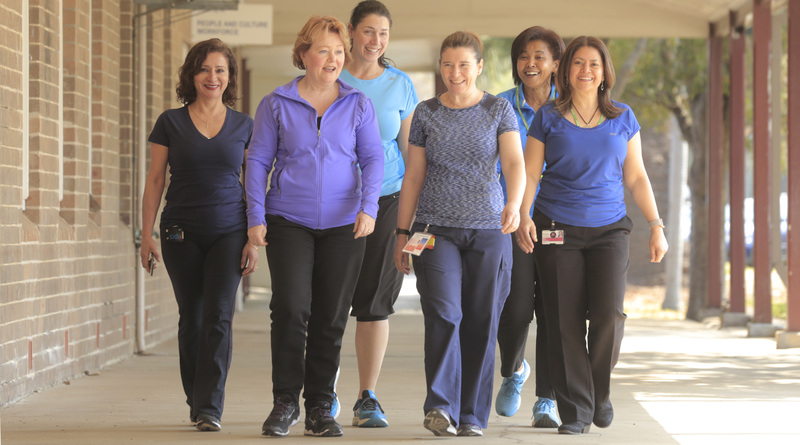 Although no one in the Staff Health teams has previously participated in Steptember, ‘she got legs and she knows how to use them’ have already raised $900, making them the third highest fundraising team so far. Deirdre credits their success to careful team selection. “We have eager participants and good contacts for fundraising,” she said. Social Work Team Leader Nicola Haig from Auburn Hospital was part of last year’s top fundraising team, Joy Luck Club, which raised $2,185. Nicola is participating again this year, motivated by the desire to raise awareness of people living with cerebral palsy and other disabilities. “The added benefit is ensuring that I keep moving and active,” she said. Receiving bonus donations for reaching the 10,000 step target for more than 25 days, was one way Nicola boosted her donations. If you’re not stepping this year, you can still support kids with cerebral palsy. Go to the Donations page and enter the name of a colleague or team or “Western Sydney Local Health District” to make a tax-deductible donation.